7/3/2007 – Why did Reuben Fine withdraw from the 1948 world championship? Did Capablanca lose an 11-move game to Mary Bain? 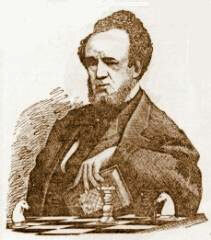 Was Staunton criticized by Morphy for playing ‘some devilish bad games’? Did Alekhine play Najdorf blindfold? 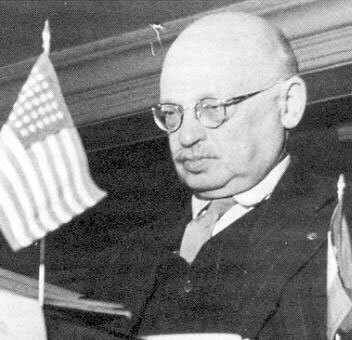 Was Tartakower a parachutist? 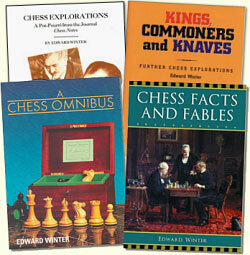 These and other mysteries from Chess Notes are discussed by Edward Winter. Readers are invited to join in the hunt for clues. Any other explanations by Fine will be welcome. Who first made this remark, and in what context? 1 e4 e5 2 Nf3 Nc6 3 Nc3 Nf6 4 Bb5 Bc5 5 O-O O-O 6 Nxe5 Re8 7 Nd3 Bd4 8 Ne2 Rxe4 9 Nxd4 Nxd4 10 Ba4 Ne2+ 11 Kh1 Nxc1 12 White resigns. That is the usual version of an apparent loss by Capablanca to Mary Bain in Hollywood in 1933, but discussion of the game in a number of C.N. items (see pages 191-192 of Chess Explorations) has not clarified exactly what happened. As pointed out by Pablo Morán (Gijón, Spain), the game-score was published by J.A. 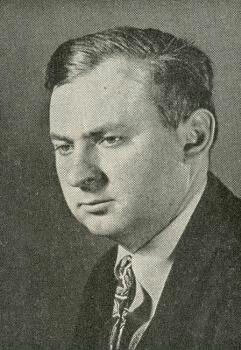 Seitz on pages 183-184 of Caissa, October 1941, and the date of the game appeared there as 21 March 1933. That month, however, Capablanca was touring Panama, and it was on 21 May 1933 that he gave his only simultaneous exhibition in Hollywood (+21 –0 =2). 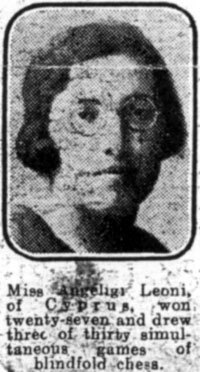 A major discrepancy, though, is that when the American Chess Bulletin (May-June 1933, page 87) carried a brief report of that display it stated that Mrs Bain was one of two players to draw. 1 e4 e5 2 Nc3 Nf6 3 Bc4 Bc5 4 d3 d6 5 f4 Ng4 6 fxe5 Nf2 7 Qf3 O-O 8 Qg3 Nxh1 9 Qf3 Qh4+ 10 White resigns. Source: Nordlivländische Zeitung, 14 March 1914 (new style). What happened to A. Gibaud? The story of the discredited Gibaud v Lazard game (1 d4 Nf6 2 Nd2 e5 3 dxe5 Ng4 4 h3 Ne3 5 White resigns) was related on pages 350-351 of Kings, Commoners and Knaves and, as subsequently mentioned in C.N. 3077, we should like to know when Amédée Gibaud died. It is a point on which the reference books are silent. Gibaud (who was born in 1885) won the French championship several times. Page 338 of the November 1946 issue of Le monde des échecs (which gave his forename as Aimé) stated that he had retired from the French postal service and was living in Nice. 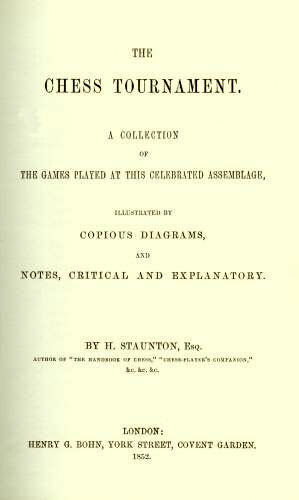 Did Paul Morphy really write in one of Staunton’s books that the latter had played ‘some devilish bad games’ and, if so, where is that book today? The affair was discussed in C.N. 2885. ‘C.A. Buck of Toronto, Kansas is the author of this interesting and comprehensive biography of Paul Morphy. Pages 213-215 of Paul Morphy The Pride and Sorrow of Chess by David Lawson (New York, 1976) gave further particulars of the genesis of Buck’s work and commented that it ‘appears to be responsible for a number of erroneous statements that have been widely accepted’. 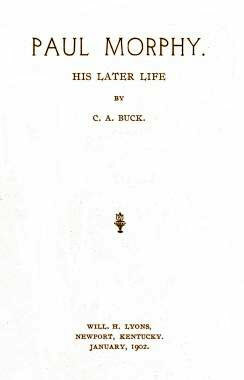 Lawson listed many examples, but had not mentioned Buck earlier (i.e. on page 42) when (unquestioningly) relating the ‘devilish bad games’ matter. On page 54 of The Human Side of Chess (London, 1953) Fred Reinfeld asserted that Buck was ‘a subsequent owner of Morphy’s copy’ of the Staunton tournament book, but we recall no other claim that the volume owned by James McConnell (1829-1914) passed into Buck’s possession. Nor do we know what happened to McConnell’s books when he died (in New Orleans on 21 November 1914). The caption reads ‘Miss Angeligi Leoni, of Cyprus, won twenty-seven and drew three of thirty simultaneous games of blindfold chess’. What more can be discovered about her? What is known about over-the-board meetings between Alekhine and Najdorf? In C.N. 3367 Mig Greengard (New York) referred to page 48 of Liliana Najdorf’s book Najdorf x Najdorf (Buenos Aires, 1999), which features M. Najdorf’s account of a conversation with Alekhine in Buenos Aires in 1939. Over whisky they discussed how many games they had played against each other, and after a claim by Najdorf of three games (2-1 in his favour) Alekhine stated that there had been only two, both drawn. 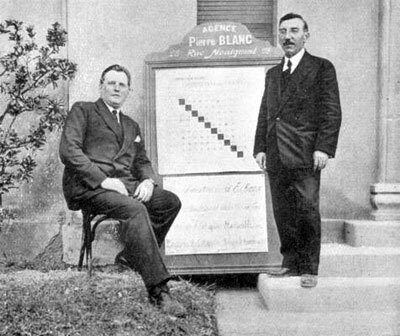 To this Najdorf retorted that in Poland in 1929 Alekhine had given a simultaneous display on 30 boards plus two blindfold games and that Najdorf had been his opponent in one of the games played sans voir. Alekhine then replied: ‘Thirty games plus two blindfold … You sacrificed a rook on R7? It’s you. You’re right.’ Our correspondent noted that Alexander Alekhine’s Chess Games, 1902-1946 by L. Skinner and R. Verhoeven (Jefferson, 1998) contains only one game involving the two masters (a draw in Warsaw in 1935, with Najdorf one of three consultants facing the then world champion). We first raised this topic in C.N. 1660, following the publication of an interview given by Najdorf to Eduardo Scala on pages 22-28 of the June 1988 Revista Internacional de Ajedrez. In essence, Najdorf’s story was the same, except that in the Spanish magazine he gave the occasion of the blindfold game as Warsaw, 1927 rather than 1929 and stated that there were 40, not 30, simultaneous games, in addition to two played blindfold. Moreover, Najdorf said, Alekhine mentioned the two draws as having occurred in Warsaw and Prague. We are aware of no record of chess being played by Alekhine in either Warsaw or Prague in 1927 (the year given in the 1988 interview). Another consideration is that neither the 1988 interview nor the passage in Liliana Najdorf’s book refers explicitly to the 1935 consultation game, which leaves it unclear whether Alekhine and Najdorf were including that encounter in their respective tallies. ‘The Polish club, he claimed, deliberately annoyed Alekhine by announcing that only 20 players had paid for the privilege to participate, and Alekhine insisted on being paid the agreed fee despite having only half the field. Reluctantly, the club directors agreed and proposed that Alekhine play ten games by sight and ten blindfold. Alekhine agreed. The club then snuck all the best players into the blindfold room and put ten patzers on the games that Alekhine could view. Just as the club directors had contrived, Alekhine had a terrible time. He wiped out the players he could see and sat racking his brains on the blindfold games, where the masters were in ambush. Concerning his own game, Najdorf told me he was on the black side of a Sicilian in which the players had castled on opposite wings. Alekhine was breaking through when Najdorf uncorked the standard …Rc8xc3 exchange sacrifice. Alekhine had seen that shot and did not bother to recapture the rook, pursuing his own attack instead. The move he had missed was the follow-up …Rc3xa3, and Najdorf’s attack was first and decisive. Can anything more be discovered about this matter, either from local reports of the time or from other articles or interviews by Najdorf? In the interview on pages 22-28 of the June 1988 Revista Internacional de Ajedrez which was mentioned in the previous item Najdorf asserted that Savielly Tartakower was an ‘intimate friend’ of Charles de Gaulle and was offered a political post by the General. Page 100 of The Sorcerer’s Apprentice by D. Bronstein and T. Fürstenberg (London, 1995) stated that during the Second World War Tartakower (born in 1887) was several times ‘dropped by parachute behind enemy lines on secret missions’. Does any evidence exist for these claims?